144 pages | 4 B/W Illus. Veterans Treatment Courts provides a comprehensive, empirical analysis of the burgeoning veterans court movement from genesis through operation, concluding with comments on its societal relevance. Beginning with the unlikely convergence of therapeutic jurisprudence with the oft-misunderstood warrior ethos that undergirds the entire movement, the text examines every component of veterans courts, weighing the cultural, legal, and practical strengths and limitations of these programs. Each chapter assesses key components of the court, including the participants, law enforcement, judges, prosecution, defense counsel, court administration, data management, the veterans justice outreach officer (VJO), probation, mentors, and the community. The book concludes with recommendations on how these courts can further integrate with communities, maximize efficiency, and improve. The book shows how veterans courts seek to serve veterans’ legal, social, and psychological needs, and how they serve more than just offending veterans by allowing law-abiding veterans, many of whom suffered greatly when they transitioned out of military service, to exorcise their own demons and integrate their experiences into a socially recognized system of care. Incorporating program evaluation with sociological considerations, this monograph offers a comprehensive, considered examination of how—and why—these courts operate, and provides a foundation for future development. The volume provides essential background for scholars studying law and the criminal courts, as well as policymakers, judges, academics, students, and practitioners concerned with effective jurisprudence. 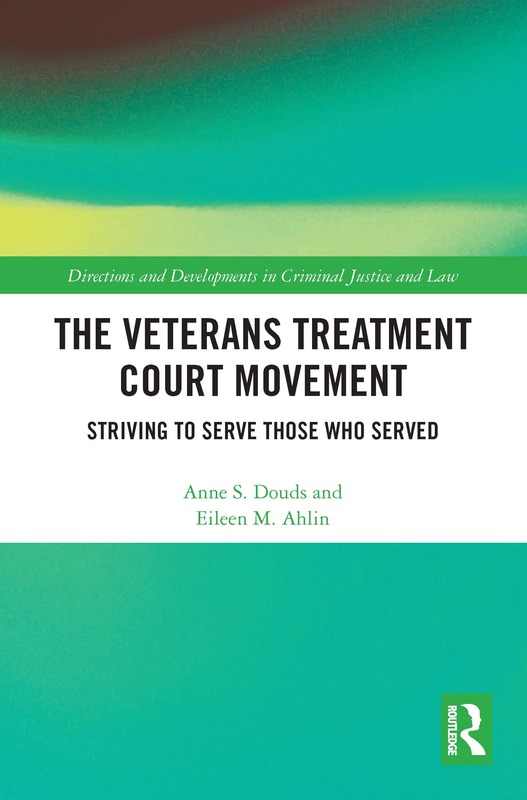 The Veterans Treatment Court Movement: Striving to Serve Those Who Servedis the most comprehensive book available on veterans treatment courts (VTCs). Building upon the authors’ own expertise in the subject matter, the text offers a thorough examination of current research on VTCs, their historical ideology, and future directions intended to maximize their efficacy. Whether you are a student, practitioner, or seasoned researcher interested in these courts, I highly recommend this well-written and in-depth text. Anne S. Douds is Assistant Professor of Public Policy at Gettysburg College in Pennsylvania and a retired trial attorney. She received her B.A. in Political Science from Duke University, her J.D. from Emory University School of Law, and her Ph.D. in Justice, Law and Crime Policy from George Mason University. Her teaching and research interests include constitutional law, civil rights law, victims’ rights and advocacy, problem-solving courts, and social justice. Eileen M. Ahlin is an Assistant Professor of Criminal Justice in the School of Public Affairs at Penn State Harrisburg. Ahlin joined the faculty in 2013 after 15 years at Westat, where she conducted research at the federal, state, and local levels. She received a B.A. in Administration of Justice and Sociology (multiple major) from Penn State University and her M.A. in Sociology (focus on crime, delinquency, and corrections) from George Mason University. She earned her Ph.D. in Criminology and Criminal Justice from the University of Maryland, College Park. Her teaching and research interests include criminological theory, violence, neighborhood effects, corrections, racial and social justice, and research methods. The ways in which crime is constructed in society is of time-honored interest to criminologists across the globe. The ever-changing landscape of what is criminal and what is not affects scholars and policymakers in their approach to the body of law defining prohibited conduct, how that law evolves, and the modes by which it is administered. Rule of law cannot exist without a transparent legal system, strong enforcement structures, and an independent judiciary to protect against the arbitrary use of power. Critical consideration of the mechanisms through which societies attempt to make the rule of law a reality is essential to understanding and developing effectual criminal justice systems. The Directions and Developments in Criminal Justice and Law series offers the best research on criminal justice and law around the world, offering original insights on a broadly defined range of socio-legal topics in law, criminal procedure, courts, justice, legislation, and jurisprudence. With an eye toward using innovative and advanced methodologies, series monographs offer solid social science scholarship illuminating issues and trends in law, crime, and justice. Books in this series will appeal to criminologists, sociologists, and other social scientists, as well as policymakers, legal researchers, and practitioners.